We offer a dental home to patients seeking gentle care in a friendly atmosphere. Dr. Bill Schlosser has extensive training in cosmetic procedures, helping patients achieve the smiles they have always wanted. With proven treatments and conservative approaches, natural teeth are preserved and the smile enhanced to look and function beautifully. 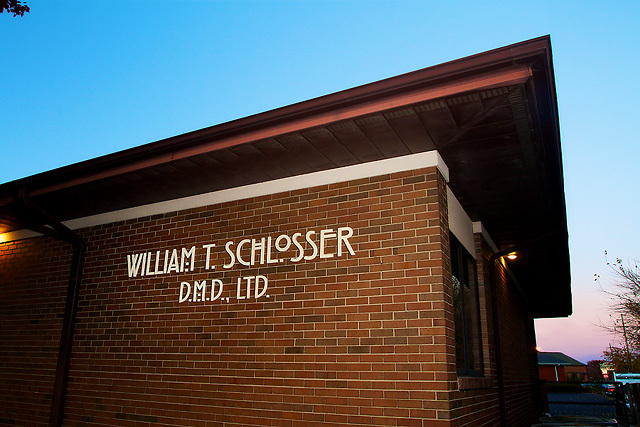 William T. Schlosser, DMD, Ltd is a modern office, offering services tailored to patient comfort. We provide the personal touch every patient deserves to residents of Springfield, Chatham, Rochester, and surrounding communities. Our treatment focus is providing healthy smiles that are fully functional and beautiful. When you come to us for dental care, we take our time getting to know your particular smile and your specific needs. Then, we create a customized treatment plan to maximize your smile and address those needs. We use proven dental materials to enhance the uniformity of the smile, such as tooth-colored bonding and dental porcelain. These are metal-free materials designed to match the look of teeth, which allow us to adapt our approach to each individual smile. Dental porcelain can also be matched to the shading of your smile, so dental restorations such as veneers, crowns, and bridges, are uniform with your natural teeth. Dr. Bill Schlosser understands receiving dental care can be uncomfortable for patients of any age, but we provide amenities and solutions for patients to relax during and after their time in our office. With Wi-Fi and Pandora™ throughout the space, patients can use their phones and listen to calming music. Some prefer to watch movies in our treatment spaces, using the Cinemizer™ system, connecting Netflix to eye glasses for an experience much like watching a movie at the theater. The Cinemizer™ works wonders for restless children, or for adults who prefer this calming distraction during treatment. For lengthy procedures, or patients with dental anxiety, we offer minimal sedation through oral medication. Although awake during their time in our office and able to respond to our prompts, most patients report little to no memory of their treatment experience. Following procedures requiring numbing agents, we also offer OraVerse® which reverses the anesthetic effect and restores full comfortability to the smile, so patients can resume their daily activities without the look or feel of a numb mouth. Browse our website to discover how our dental team enhances smiles in Springfield, Chatham, Rochester and surrounding communities. To schedule an appointment, feel free to call us or use our convenient online form. We look forward to hearing from you!